Our online courses help FCM, IB and BD trainees fulfill requirements of the USA PATRIOT Act and RMLO trainees fulfill requirements under the Bank Secrecy Act. Training for RIAs is considered a best practice. 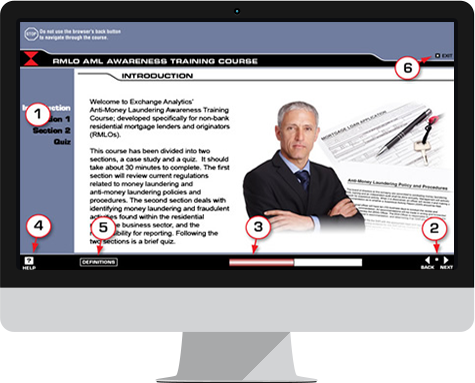 PREVIEW AML TRAINING FOR FCMs, IBs, BDs & RIAs NOW! The USA PATRIOT Act of 2001, section 352, has required NFA-member and FINRA-registered firms to have anti-money laundering (AML) compliance programs in place since April of 2002. 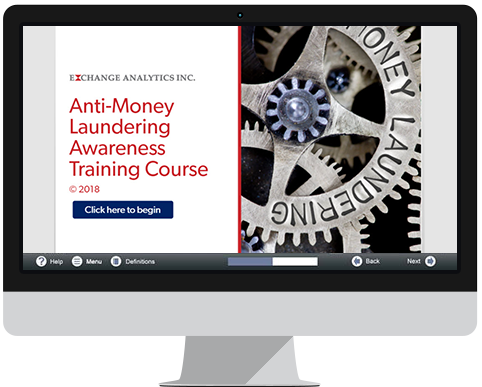 Institutions must provide ongoing AML education and training for all appropriate personnel. We recommend that any employee involved in the flow of funds or account documentation take an AML training program annually. NFA-regulated firms must have their associates complete training on a 12-month cycle. The Department of the Treasury’s Bank Secrecy Act has required non-bank residential mortgage lenders and originators to have AML programs in place since August of 2012. Requirements for RMLOs are substantially similar to the requirements for NFA and FINRA members, including the establishment of ongoing training with content tailored to the needs of the industry. Length of Course: Approximately 40-50 minutes; you may save your progress and return to the program as often as needed. Length of Course: Approximately 30-40 minutes; you may save your progress and return to the program as often as needed. What's Included: Interactive audio-video course delivered via secure LMS platform; course completion confirmation to trainee and firm; electronic record archiving; on-demand record retrieval. Each firm must develop written policies that meets its specific needs. If you need help, our affiliate EA Compliance can assist your firm in the development of appropriate internal policies, procedures and controls. Each firm must designate one or more person as the AML compliance officer(s), and have those individuals register as such with either the NFA or FINRA. AML compliance officers are responsible for ensuring their firm’s compliance with all federal, state and regulatory responsibilities under the USA PATRIOT Act. Regulated financial institutions must provide ongoing education and training for all appropriate personnel. At a minimum, a firm should provide annual training on the firm´s policies and procedures, the relevant federal laws and regulatory AML requirements. NFA-regulated firms are required to provide training at least every 12 months, while FINRA-regulated firms are encouraged to provide training at least annually. Firms must maintain records to evidence their compliance with this requirement. Regulated financial institutions must conduct annual testing of their AML compliance program. This testing can be done by personnel of the firm (such as an internal audit staff) who are independent of the personnel working in areas that are exposed to potential money laundering risks, or by hiring an outside party with experience in this type of audit. The results of this audit should be documented and reported to the firm´s senior management or an internal audit committee. Our affiliate EA Compliance can perform an independent, third-party audit of your company’s AML program. EA Compliance provides a fully documented audit and will submit its findings to your firm’s senior management or internal audit committee along with appropriate recommendations.